Do the best you can with what you have. At a minimum, do no harm. At maximum every consideration should be made for Quality and Efficiency. Way before you get to the studio, decide whether you're going to track live or overdub. If you were going to give a public speech, or maybe if your team had a game, you would surely make sure you were rested and prepared for your big day. The same goes for the studio. Just because Jim Morrison made it through sessions in a drunken ‘rock and roll’ fashion, doesn’t mean you can. Many of you will be on your own budget, not the seemingly endless budget of a major record label, time is YOUR money. Instead of abusing substance to try and ‘get creative’, show up relaxed and focused. In my studio, every minute late that you are is on your dime. If we agree to begin recording at 10am until 6pm, and you show up an hour late, you will only have 7 hours to track. Include your set up time, especially drums, and you will run out of recording time fast. I recommend showing up at least 30 minutes early, or even try and talk your engineer into letting you come in the night before to set up drums. Given the amount of time it takes for the drummer to set everything up, and the engineer to mic everything properly, and then get levels, you could spend an hour or two. Bring extra everything. If you are a guitarist, change your strings. Bring two guitars, bring extra strings for each, bring a pack of picks. Drummers, change your heads a day or two before the session. Read this is you are unfamiliar with changing/tuning drum heads. bring several pairs of sticks, have a backup set of drum heads, etc. The more prepared you are for any kind of mishap, the less time and money you will waste when they happen, and they DO happen. That is to say, know your music. Practice until it is perfect and only then is it time for you to try and record it. You would be surprised how many bands show up to record and are still ‘arranging’ their songs or unable to cleanly play their music. There is nothing worse as an engineer than having to sit through one guitar riff or vocal line for 30 minutes while the artists fumbles their way through. It is a waste of time and money for everyone involved. I recommend to any group that is coming to record with me, to spend the two days before coming into the studio rehearsing the material. Regardless of using a click track while you are recording, practicing to a click or metronome will help your internal clock. The more you do it, the better you will become at it, and you will be able to hold steady counts and beats more naturally as your progress. Sometimes songs will change beats in the middle of the song, and with many software metronomes you can set them up to make those changes properly. The two instruments that are out of tune the most in my sessions are the drums and the vocals. Tuning drums is something every drummer, and in my opinion every engineer, needs to learn. While many studios have house instruments that you can rent or use that are probably already tuned up, they may not always be available. Also, being a musician, I know the feeling of wanting YOUR instrument to be on the track and not some studio gear, so tune up your own instrument. As for tuning vocals, this is something that comes with being a good vocalist. If you can not sing on key, learn how to or find someone else. Auto tune is not as cool as the mass media might lead you to believe, though that is not to say it does not have its purposes. If singing on key does not come naturally for you, take some lessons from a professional. It takes time and effort to learn how to use your voice as it does with any other instrument. Nobody wants to record or listen back to out of tune vocal tracks. Having any instruments out of tune on your recordings is going to greatly bring down the quality of your sound, so make sure you being your tuner. There is NOTHING more annoying or distracting while trying to work with an artist than having to talk over or listen over the other band mates talking behind you. I am a big fan of having the band involved in the whole process, but I have definitely sent people out of the studio and asked them to stay out until we are finished because they were being too loud and distracting to both me and the artist being recorded. In this light, you also need to LEAVE YOUR FRIENDS AT HOME. The studio is not a place for your whole posse to come hang out, bring the band only. A mentor of mine once said the phrase “too many chefs ruin the brew”, which is exactly what happens when you get too many people in the studio. Who is the person in your band that has the best ear overall? The one that can see the music as a whole of many pieces and not just want to crank the guitar tracks up as loud as possible. This may be one or two people, but you need to decide on the ‘leader’ who will work closely with the engineer to make sure the bands concept is getting across. After everything is recorded, this person will also sit in on the mixing sessions to work out levels and placement of instruments and such. If you have taken my advice and ‘mastered your music’, ‘practiced for the two days before recording’, when you step into the studio, you should be able to knock it out. What you shouldn’t be doing is arguing between each other(like all bands do) in the studio. Save that drama for your mamas basement. The studio environment needs to be relaxed and creative, not stressed and tense. After all these ‘rules’ it might seem like recording isn’t any fun at all. Quit the contrary, when all parties involved are aware and comfortable with these ‘rules’, the recording process becomes a very special time. Without having to worry about being in tune, people chatting away or being distracting in the background, rushed for time, etc., you are allowing yourself to let loose. This gives you the opportunity to really let this music you have been working so hard on, really shine. Make sure your producer and engineer understands what sound you want, but keep in mind, they can't exactly reproduce another album's recording conditions for you. Just because your favorite band's drum tracks sound a certain way doesn't mean yours can -- that is, unless you use the same drummer, same kit, same room, same mics, same everything. Bring some examples of styles you'd like to see reflected in your work to your producer/engineer ahead of time, and let them explain to you how they can split the difference to help your project come out as close to what you want, and remember: individuality IS a good thing! Adrenaline runs high in a situation like a recording studio, especially when you're racing to beat the clock to save money. But knowing when to quit can be really helpful, too. The longer you push your ears, and longer you physically continue to perform, you'll get tired and thus your performance will suffer. It's better to know when to walk away for the day, and come back the next day refreshed and ready to go. It's not failure, it's making the best of your time. Your producer and engineer are susceptible to fatigue, too; keep them in mind when trying to fit in a marathon recording session with your band. Optimum mic placement will depend on the sound of the instrument and the sound of the space it's in. As a general rule of thumb, start by listening to how and where the instrument makes its sound, and what the room contributes to that sound. Position your mic to achieve the right balance between the two. You've got to start somewhere, and most tracks are built on rhythmic foundations. So if you're recording a track bit by bit, get some proper beats down first. This gives the musicians something real to play to (rather than just a click) and will help shape the feel of the track. For most instruments, you'll be looking to add and adjust effects levels (reverb, delay and so on) when you mix, so recording these with your original sound can be a mistake. However, there are exceptions – for example, electric guitar parts, where the effects are an integral part of the sound and performance. For guitars and bass, try recording separate DI and mic signals. This gives you a clean DI sound and a character-rich amp sound, and balancing them on playback gives you the best of both worlds. If you later decide the original amp sound isn't right, simply put an amp sim plug-in to work on your DI signal. 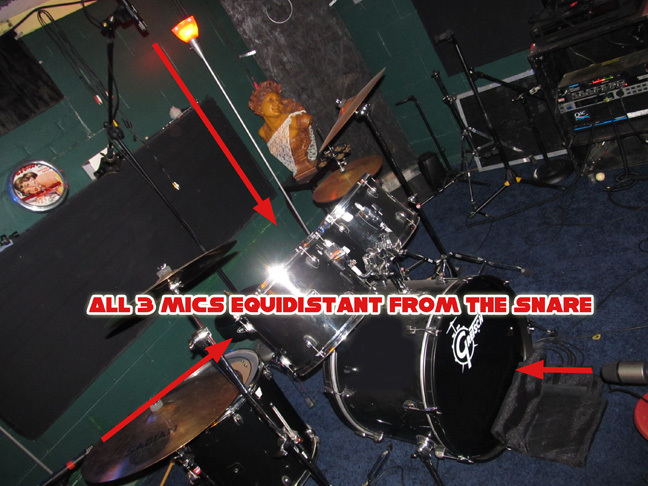 "Recording drums could easily involve ten or more mics, but this won't necessarily make them sound better." Serving up a perfectly mixed headphone feed may make the performer feel good, but it can be deceptive. Keep it simple: concentrate on providing a solid pitch reference, a solid timing reference and foldback of what's being played (with added effects if required). This should give the musician all they need to deliver a good performance. A higher bit depth enables you to have a greater dynamic range and to capture more subtle detail in your recordings. On the downside, a 24-bit file is 1.5 times the size of a 16-bit file. Even so, the benefit outweighs the cost, because the extra dynamic range means you can allow yourself more headroom when you're recording. With new interfaces delivering 96kHz and even 192kHz audio, the pressure is on to record at higher sample rates. However, the norm remains 44.1kHz or 48kHz. Part of the reason for this is file sizes, with 24-bit/96kHz recordings requiring over three times the space of CD-quality audio. This being the case, it may be prohibitive for massive multitracked sessions, but it's worth trying higher sample rates for simpler sessions. Just keep an eye on your hard drive space. Always bear in mind that your mic could be recording unwanted extras. Combat this by picking a pair of headphones that are fully enclosed. Then set your headphone level to avoid loud volume when you're recording quiet tracks. Many audio interfaces now offer basic hardware monitoring. Even a simple analogue desk can provide you with the same options and more besides, including auxiliary sends for effects and a dedicated headphone send. The whole idea may seem like a bit of a step backwards, but if you do a lot of recording, it can prove productive. Getting a clean signal into your computer requires a basic understanding of the way signal levels work. Mic preamps always have an initial gain control, but they may have other level controls later in the chain. For best signal performance, set these to zero or unity, and use the initial amp gain to adjust the level to your needs. On a tape machine, dropping in to record overdubs is a pretty straightforward process. This isn't the case with all audio sequencers, but on the upside, you'll likely have more tracks to play with. Simply set up a 'monitor' track and drag takes onto it for playback while you continue to record to new tracks. With 24-bit recordings you shouldn't run out of dynamic range, so the technical need to compress when recording is less than in days of old. However, you may want to do so purely for convenience. Avoiding fast release times should make any unexpectedly heavy compression less obvious. If you're confident in your monitoring, EQing when recording is a good plan. Even so, if you find you're boosting certain frequencies by more than 6dB, beware. One cautious rule of thumb is to split the difference between zero and your preferred amount of boost. If you record in the same room as your computer, noise can be an issue. Position a directional mic so that its rejection node points at the noise source. Alternatively, if possible, manually reduce the computer's fan speed. Just don't try to hide, cover or screen off your PC, as it will just get hotter and noisier. A simple 'flying' lead can connect you (and some mics) with other rooms in your house. Bedrooms often make good dead spaces, thanks to the abundance of soft furnishings they contain (and they also tend to be in quieter parts of the house). Using a separate recording space enables you to listen objectively while recording. Directional mics can be surprisingly good at keeping out unwanted room noise. In a small space, try a cardioid with good rejection and a tight pickup pattern. Alternatively, try capturing a singer/guitarist using a figure-8. A posh microphone won't make a poor instrument or bad performance sound any better. Look for weaknesses in your playing and instruments and address them first, then you can reward your efforts by splashing out on a new mic. Amid the flurry of preparing for a recording session, you might forget to get your software straight. If you're planning to record regularly, it's a good idea to set up a song template or two for different situations, with inputs and outputs all suitably routed. "If you record in the same room as your computer, noise can be an issue. Position a directional mic so that its rejection node points at the noise source." These days, most decent audio software enables you to group tracks together easily. This is now an essential process when recording and editing multitrack sessions, because with concurrent tracks locked together and fully in sync, you can edit them quickly and simply as one unit. Before recording in an unfamiliar space, take a walk around, talking, shouting and clapping your hands in different places. This will give you a good impression of how various parts of the room respond to different volumes and sounds, so you can set up appropriately or make changes if necessary. Achieving a good room/direct sound balance using a single microphone can be difficult. If you do want to capture some natural ambience, set up a separate microphone for the purpose. The ideal position will depend on the room's size and character – there's no substitute for a little experimentation. Multitracking and overdubbing will lay bare any tuning issues you have. Stay on top of tuning at the recording stage and you'll find finishing the track much simpler. Check your instrument tuning between each and every take. If in doubt, listen back with the musician or singer, pinpointing the problem areas – then fix them. Ruggedness, sensitivity and sound are all major considerations when it comes to choosing a mic. For handheld use, a typical condenser will be too vulnerable to contact noise, so use a dynamic. For quiet sources, on the other hand, you'll need something quite sensitive, so use a condenser mounted on an appropriate stand. It's all too easy for your ears to become accustomed to poor playing or bad tuning while you're concentrating on the technical side of the recording process. To counter this, try to retain an overall sense of perspective (also known as 'punter's ears') and address problems at the source rather than planning to fix them later. Q: We’re about to go into the studio to record, and I want to make sure we’re being smart and protecting ourselves here. What advice do you have for us before we record our new CD? A: My biggest piece of general advice to all of you is to do something you are already doing: educating yourself. Protecting yourself and your musical creations before anyone pushes the “record” button is one of the most important things you can do for your music careers. From a legal standpoint, there are six steps that I always share with clients – a checklist of sorts before they go into the recording studio – that I hope will be as helpful to you as being able to speak Klingon at the Comic-Con convention. Step One: File your Form PA (for published or unpublished works of the performing arts) with the Copyright Office. I’m often asked whether this step is even necessary, and if so, why? Here’s the deal: it’s true that copyright exists the moment something is created and fixed in a tangible form of expression. However, registering your work entitles you to certain important rights. It’s easy to do, and with the additional tip I’ll share here, it’s very inexpensive: if you know all of the songs you’re going to record in advance (which tends to be the more cost-effective approach to recording in my experience), you can submit a single Form PA for the entire collection of songs, and it will only cost you one filing fee (currently $35.00 for electronic filings). So, what important rights do you get for registering your work? First, you have to register your works with the Copyright Office in order to gain access to the Federal courts to enforce a claim for copyright infringement. Second, if you register your works in advance, you may be eligible for “statutory damages” (you know the F.B.I. warnings that threaten big monetary damages before every movie? ), as well as the recovery of attorneys’ fees. Third, if registration occurs within five years of publication of the work, your burden of proof at trial is made easier by the Courts. At this point, you may think that none of that really matters. However, if someone used your material down the line and made a lot of money off of it without your permission or the proper licenses in place, you would probably feel as hopeless as a one-armed man in an applause contest. Think of it this way: registering your works is kind of like buying car insurance. You never need it until you do, and then, the more the better. You are also much more likely to find an attorney willing to take a case on contingency, or even pro bono, if they can seek to recover their attorneys’ fees from someone else at the end of the day. Step Two: Talk to your songwriting partner(s) and/or bandmates and work out whatever you guys need to work out so everyone is on the same page going into the studio. Does everyone get equal copyright ownership and control over the songs and the sound recording? Did one person write all of the songs, and if so, do any of the other band members expect any copyright ownership over the material? Are you going to treat copyright ownership of the sound recording differently from ownership of the songs themselves? Is one person going to be in charge of licensing decisions and be allowed to sign for the band, or does everyone get a say? Did your drummer really just implode and vanish into thin air? I have a laundry list of questions that I ask my clients to discuss with their songwriting partners or bandmates before they head into the studio, so everyone is on the same page. These are questions that people hardly ever talk about before the money starts rolling in. However, they are all important things that every artist or band should consider when working as a collective (including the drummer’s history of imploding on stage). A written songwriting agreement or band partnership agreement can salvage friendships, and act as a roadmap for everyone. If you don’t have a roadmap, how do you know where you’re going? Step Three: Figure out who is going to be involved in the recording process. If you don’t want to risk them possibly owning a part of the copyright in your song or sound recording, you should have a work for hire agreement in place with them. Are you hiring a sound engineer or producer to work on the album? Is your sound engineer suddenly calling himself a producer, when you thought you were producing the album? Did you hire a string quartet, or other instruments not normally in your group, just to enhance the recording? Who is mastering the project? Each of these people contributes some creative element, however large or small, to your music in the recording studio; and depending on the nature of that contribution, they could argue down the line that they are a joint owner of the work. Although the general rule is that a person who creates a work is the author of that work, U.S. copyright law creates an exception for “works made for hire,” in which the employer or person commissioning certain works for use is considered the author of that work. Sometimes things get a little sticky in the studio; egos take over. An instrumentalist creates a riff that becomes an integral part of the song; a sound engineer starts taking on more of a producer role; maybe your cowbell player thinks his stellar bell placement entitles him to 50% of the royalties. A work for hire agreement makes ownership of the copyright clear from the outset. If someone isn’t okay with it, at least you’ll know that up front, and you can make an empowered decision whether to use that person, or whether to go with another person who is willing to sign a work for hire agreement. Keep in mind that consideration is required for a contract to be valid. This is a legal concept meaning something of value that is given in exchange for a performance or promise to perform. In some states, credit may suffice as adequate compensation. In other states, there may be a minimum amount of monetary compensation required. Step Four: When the final recording is complete, it’s time to file a separate Form SR to protect your interests in the sound recording itself. As I have said before, there is a separate copyright for the song and the recording of that song. Even though you filed your Form PA before recording, you will also want to file a separate Form SR to protect the sound recording of that song. This will become particularly important when a producer or music supervisor suddenly becomes interested in obtaining a master use and synchronization license from you for their new hit TV show. Step Five: If you plan on filming any behind-the-scenes footage or videos, get permission first. The recording process is a fun, creative environment, and with the advent of new technology, fans like to be a part of it. As artists, most of us can’t live 15 minutes without uploading photos and video footage to our social media channels to justify our existence by posting to the web; after all, we all know if you don’t post it to the web, it never really happened (kind of like the sound of that one-armed man clapping in the forest). It’s great to utilize technology as a way to keep fans in the loop. However, in most states, did you know that you can be sued for using someone else’s name, voice, image, or likeness without their permission for an exploitative purpose? If you are going to be filming any music videos or behind-the-scenes footage, or shooting photographs featuring people outside of your band, make sure to get permission first. Get a talent release from them before you start filming if possible. Otherwise, you may spend a ton of money in post blurring out faces, only to have your awesome new music video look like an episode of COPS. Step Six: Get the proper licenses if you are recording any cover songs. If you’re recording any cover songs, at a minimum, you’ll need a mechanical license. Be sure to read my previous DIY Musician blog, “Posting Cover Songs on YouTube: Music Licensing Explained” to get a better understanding of the licenses you’re going to need to record the cover song on a sound recording for commercial use, to print lyrics for the song, or to do a music video. 6. If you record any cover songs, get a mechanical license for the sound recording, and realize that you may need other licenses as well, for example, if you plan to print lyrics on the liner notes, shoot a music video, etc. Now it’s time to put those 3D glasses on and read the fine print.